The homes at Orchard Ridge feature a unique, farmhouse architectural style that you won’t find nearly anywhere else. Inspired by small-town living and the surrounding Texas landscape, each neighborhood overflows with character and charm, making the community feel as though it developed organically over decades. Farmhouse-style homes are quickly growing in popularity thanks to shows like Fixer Upper, but part of the appeal is the timelessness of these designs. At Orchard Ridge, homes blend traditional features with cleaner, modern details to create a one-of-a-kind aesthetic that’s perfectly suited to a modern, yet relaxed lifestyle. Front porches with graceful columns and exposed rafters not only add curb appeal and rustic charm to homes, but they encourage neighbors to spend time outdoors. Shutters and a variety of siding options, including natural stone, traditional brick, and board and batten, prevent the neighborhood from feeling homogeneous, and makes each home unique to the family that lives there. Farmhouse-style homes aren’t just pretty to look at, they’re exceptionally functional, too. At Orchard Ridge, homes are open and airy, with tons of natural light and floor plans that were specifically designed for today’s families. Flex spaces, extended porches and oversized kitchen islands are just a few of the things that you can find that make everyday life easier. 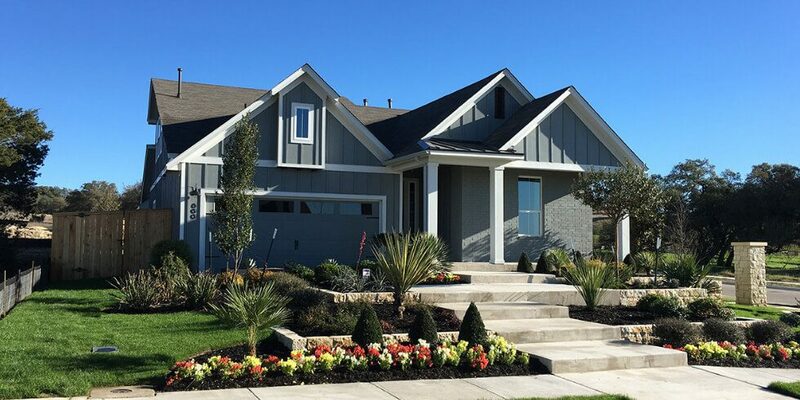 Not only does Orchard Ridge feature beautifully designed, thoughtful homes, but it’s situated in an ideal location, near major employment hubs and in the highly sought-after Leander ISD. And with pricing from the low $220,000s, one of the lowest price points in the area, you really can have it all at Orchard Ridge. To learn more about the homes and lifestyle at Orchard Ridge, schedule a tour to see it all with your own eyes or join our Interest List to stay up-to-date on Orchard Ridge news.